These are the stoves for weekend road trips and group experiences, ideal for parks, developed campgrounds, and tailgating. Nomadic lifestyles and the surge in families heading to national parks has this category on the rise and options have grown considerably in the last few years. That said, today’s car camping stove is not what your parents’ ferried around in the back of the Riviera wagon. They’re slim, engineered with precision, and ultra-portable. This year’s test includes four, two-burner options. 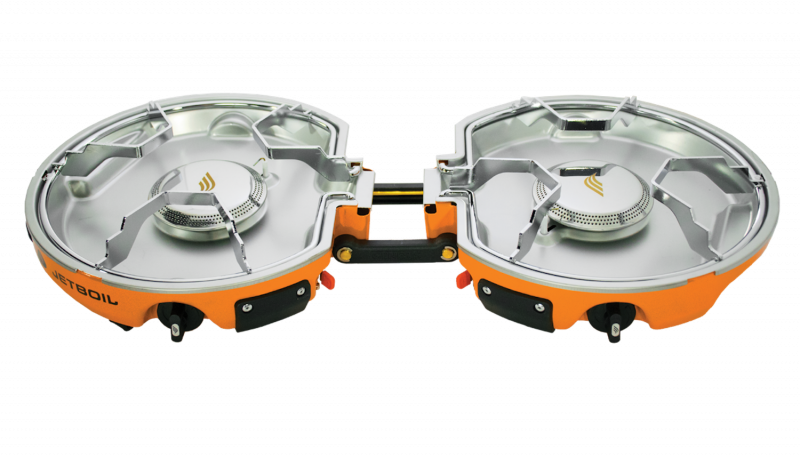 Three reflect traditional, rear-hinged case designs while another, the Jetboil Genesis, offers camp chefs an original take on portability. Two of the test subjects rested on folding supports while the others are designed to be placed on a flat surface. The features varied widely, giving us a good cross section of what’s available in the market. 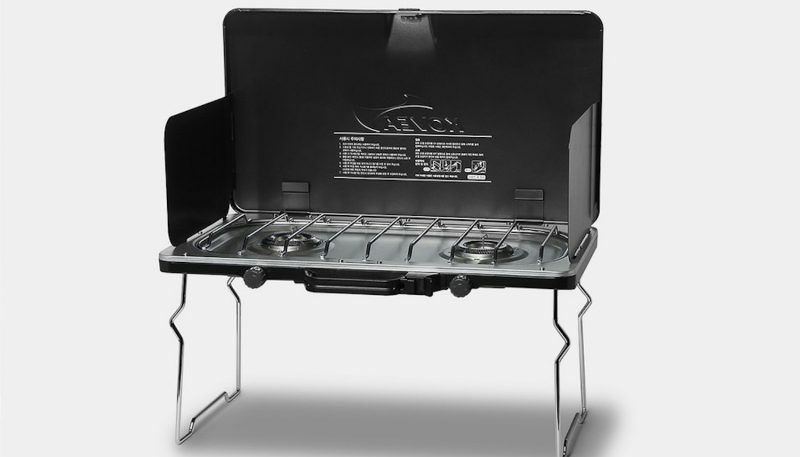 An emerging feature in the car camping stove category is the ability to adapt to multiple fuel types. 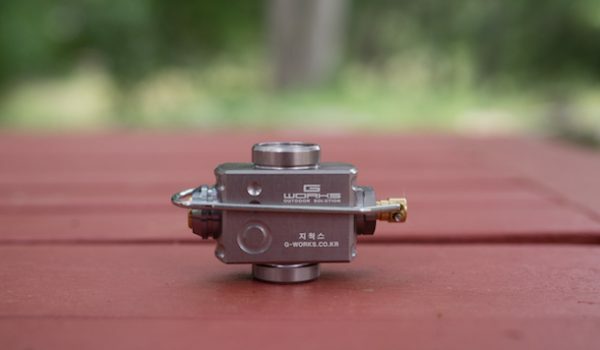 While this category is traditionally synonymous with bulky propane canisters, two of our products can connect to the same isobutane canisters one would use with a backpacking stove like the MSR Pocket Rocket. 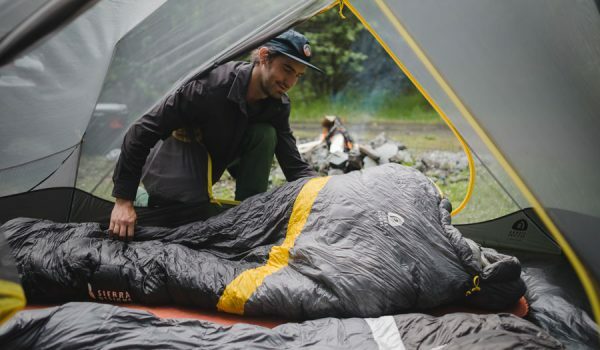 There’s also a clear effort being made on the part of product designers to appeal to a buyer who cares about campsite aesthetics as much as they do the functionality of their gear. The well-funded, Instagram-savvy camper is no-doubt on the mind of today’s equipment manufacturers. 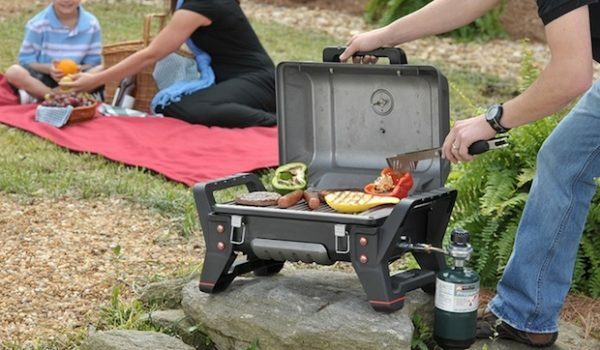 However, there still needs to be a dependable cooking tool underneath the sleek designs and emerging feature stacks of the modern car camping stove. Thankfully, that seems to be the case. Stoves were tested in snowy parking lots and breezy high desert campgrounds, cooking for as few as two and up to 20 hungry souls. Stoves were examined along the way for their durability, wind resistance, ability to simmer, and how well they packed. 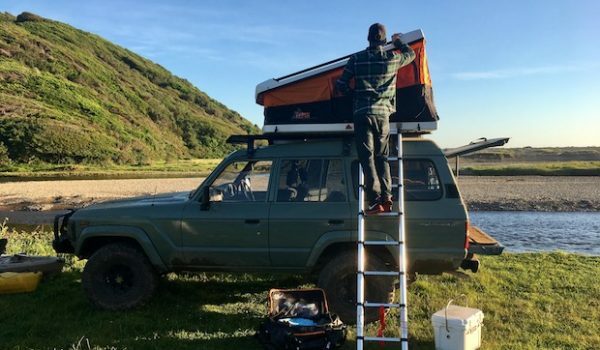 Weight and portability is a concern, of course, given that they often have to be lugged back and forth from garages to the car and then from the car to your camp kitchen. 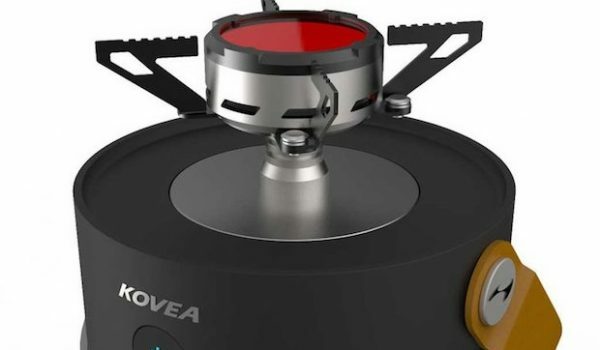 The Kovea Slim Twin is a sleek, practical, and versatile dual burner camp stove. The price is fair given its all-around durability and features, and it nicely balances power and flame control. 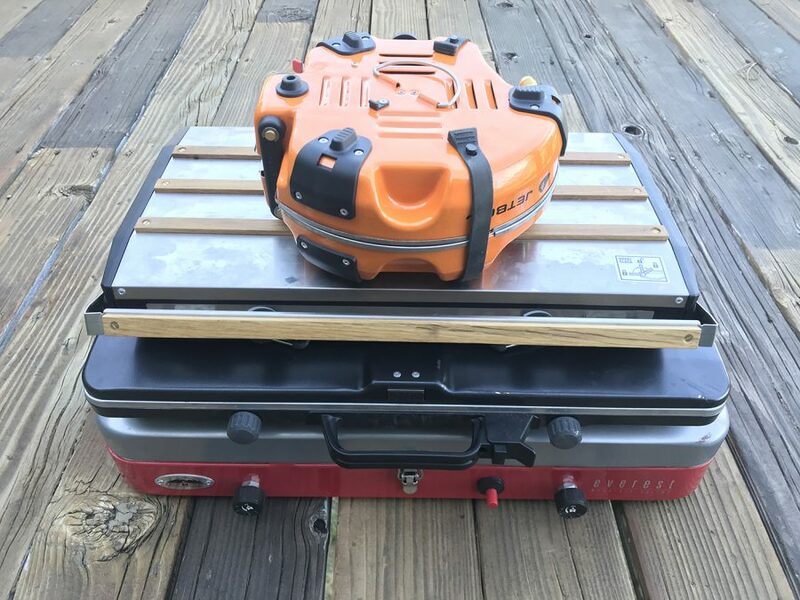 At barely 2.5 inches high when folded, Kovea has created a very portable product that can slip in between and under camping supplies and into gear bins and rooftop boxes. 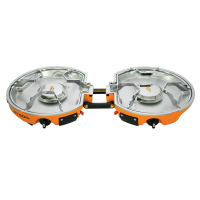 The Jetboil Genesis is a worthy competitor but has a hard time keeping up with the multi-fuel versatility practical features of the Slim Twin. 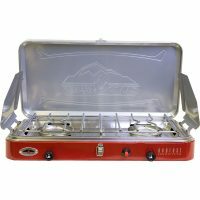 The Camp Chef Everest is the stove you buy to keep in your camper or truck kitchen, where it can accumulate crumbs in its hinges, color on its grates, stickers, and a few dents. Not only is it the most affordable stove in the test, it’s the closest to your “Father’s Camp Stove” we found. 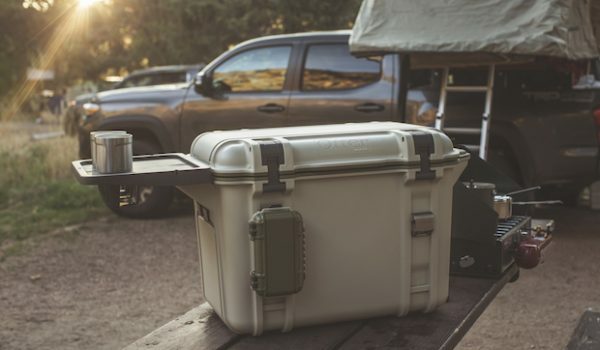 Its simplicity and bulk can run contrary to today’s nimble, sleep-anywhere-on-a-whim road-tripper, but that’s not the market a company called Camp Chef is after. I’m not a fan of how the fuel line coupling mates with the stove’s fuel line, but until manufacturers find a way to make a better system, like the Kovea Slim Twin’s, more ubiquitous, we’re all stuck with screwing around with it for a minute until it catches safely and we can cook. The Everest will also likely take up the entire end of a picnic table, so expect the propane to dangle in space and to keep cookware and ingredients on the seat or behind it. 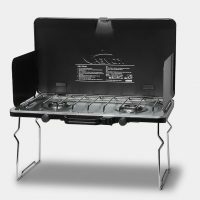 However, it’s ideal for a truck tailgate and multi-table kitchen set-ups, and overall, an affordable, family-ready camping stove. 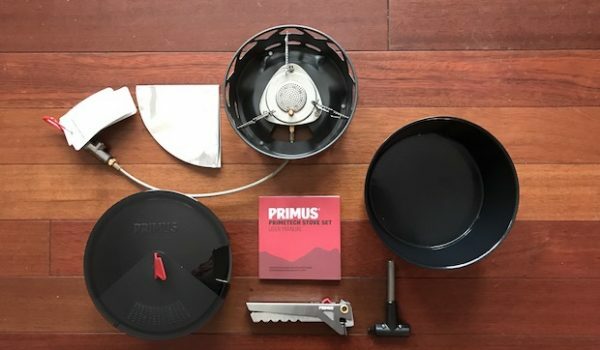 The Primus Tupike is a sharp-dressed, weekend-ready camp cooker better prepared to impress the cul-de-sac than a weary pack of alpinists returning to basecamp. That said, it knows its place, able to cook whatever is on the menu with a category-leading simmer and a sturdy cooking surface. The Tupike is clearly Primus’ call-out to the bring-everything, "Sunset Magazine" subscriber who envisions the weekend campout as a reason to get together, not necessarily a reason to be outdoors. The features are well thought out, unique, and also practical. Its lack of power and wind resistance make it most suited for fair-weather camp chefs who partner home-brew tastings with exotic campground recipes. It’s expensive, but well-built and easy to transport. The Jetboil Genesis Basecamp stands out for its unique clamshell form factor and place within a larger family of compatible cooking accessories. That said, it doesn’t stand out in its ability to cook, merely performing as it should. 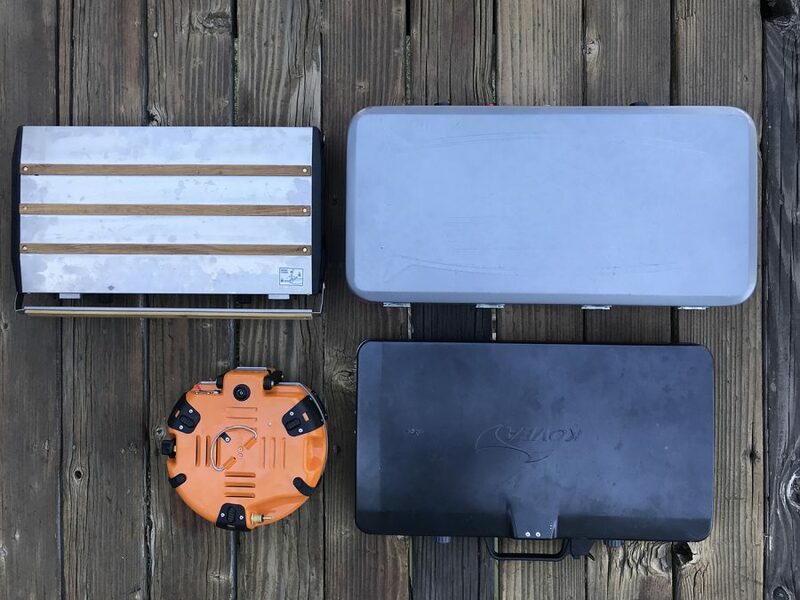 The Genesis Basecamp is also the most expensive stove in the test by almost $40, making the decision to buy one rest primarily on its potential for becoming part of a larger, connected outdoor kitchen, ideal for outfitters and committed overlanders. It packs very well, has a small footprint, and is very easy to clean and maintain, scoring the highest of any stove in terms of portability. A thin line divided the top from the bottom of this test, and where buyers land comes down to individual needs and preferences. The line gets bolder where budgets are concerned, and cost is the primary differentiator in this test. 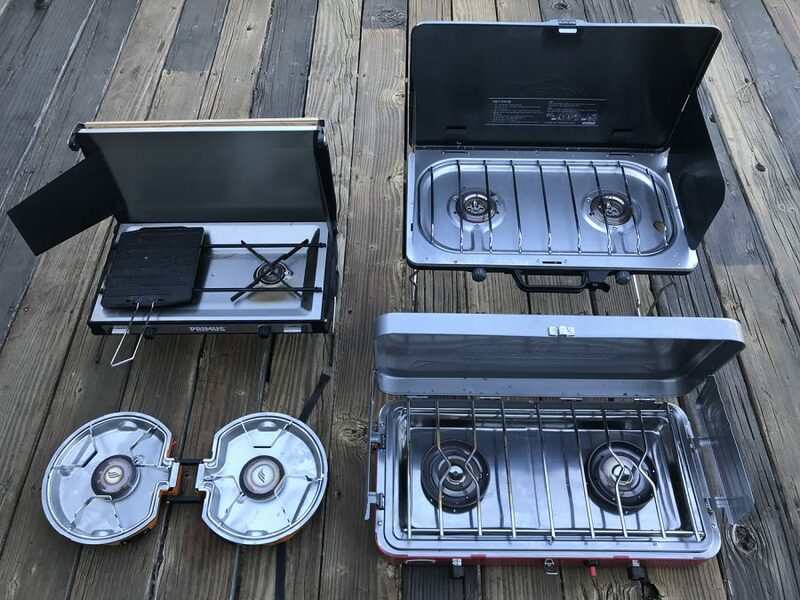 Two burner, table-top camp stoves are the time-honored form factor for outdoor meal preparation, and for the most part, the core design hasn’t changed much. What this test demonstrated is what surrounds the brass gas lines and round burner heads is what matters most. In a word, it’s all about packaging. How that packaging adds or subtracts from overall use is what will determine a person’s willingness to purchase. These stoves aren’t designed to be backpacked into remote campsites. Pulled, perhaps, or packed on horseback. Thus, until #vanlife became a thing, the size of one’s stove wasn’t a primary factor for buying. Apparently that’s changed, as dirtbags, seasonal professionals, and traveling families are carving lives out of the backs of station wagons and capped pickups. Size is now a factor, and Jetboil, for example, is betting that people are willing to pay a premium for it. Additionally, the ability to cook with something other than heavy, tough-to-recycle propane bottles has emerged as a buying consideration, probably again a result of a growth in mobile living. Don’t expect to see this trend wither. Determining a winner in this test came down to determining what stove was most applicable in all reasonable camp cooking scenarios. Could a powder-chasing snowboarder pack it into a rooftop cargo box while the every-weekend scout leader uses it to boil bratwurst? Use case scenarios vary widely, and testing these stoves means trying to predict those. In no way can our methods apply to every reason a person would buy one of the products in the test, but our methods did enough to reach the conclusion that the Kovea Slim Twin would satisfy a good majority of campers’ needs. It’s small, has middle-of-the-road power, simmers well, and can accomodate three fuel types. The stove’s feature stack in no way impacted durability, and its under-side mounted fuel attachment points offer practicality and innovation. To find where you fall on that thin line amongst these stoves, dig into our detailed side-by-side comparisons of each of our testing criteria below and then get into the in individual reivews. Across the board, all stoves in the test held up to their promise of cooking all kinds of common camp dishes without hassle. Thus, it comes down to how each performed in unique circumstances and use context. The Kovea Slim Twin and Camp Chef Everest earned the same mark in testing, but the sheer power of the Camp Chef’s 20,000 BTU burners allowed it to boil water faster and reheat cold items in superior fashion; and even with that brute force, it still maintained a steady simmer. Plus, all that power helped when the wind kicked up. The Jetboil Genesis didn’t reflect the wind-beating prowess of its backpacking brethren, even with the included plastic windshield in place. It does simmer better than the others tested, scoring the second highest. The Kovea Slim Twin simmered dependably and maintained consistent defense against cross breezes because of its practical windscreen design. Fuel type didn’t have an impact. The Primus Tupike performed adequately regardless of fuel type but had the most trouble against wind, suggesting again, it’s not the stove for those uncomfortable cooking in rough weather. It scored last in this category. 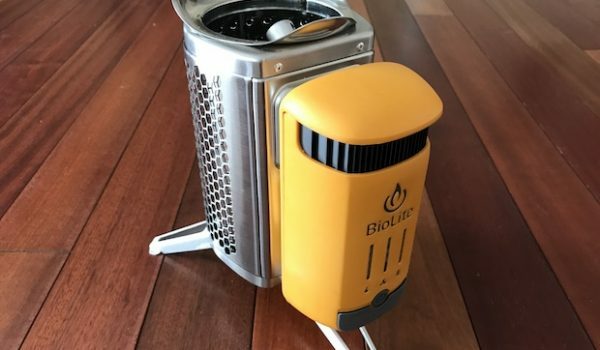 Shoppers should note that power output (BTU) doesn’t make the stove, but a few more units of fiery umph can help burners power through inclement conditions. A byproduct of unconventional engineering choices is the increased risk of things breaking in new ways. The Jetboil Genesis, for example, includes a lot of moving parts, from the obvious hinged connection points to the simple rubber straps necessary for transport. Despite the new design approach, the stove mostly held up. The straps came off easily, but are easily replaced. A grill grate bent slightly upon removal, but is also put back in place without much hassle. The Genesis scored evenly with the Primus Tupike and Camp Chef Everest, but I fear it offers the most risk of damage over prolonged use. The Tupike is tougher than it looks and the Camp Chef the opposite, suffering a bent but still functional lid after a minor drop. A small elastic band that secures the Tupike’s fuel line within its slotted compartment broke early in testing. While not related to stove functionality, it’s the only method for securing the regulator during transport. The risk of fuel line damage increases without it. The Kovea Slim Twin was the only stove to not suffer any form of damage during testing, therefore earning the highest mark for durability. A little over six pounds, the Jetboil Genesis packs up better than the rest of the test group, but actually absorbs a similarly-sized footprint when in use as the Primus Tupike. Its thin carry handles aren’t comfortable, but no camp stove is designed for prolonged individual carry. The Kovea Slim Twin is only a point behind the Genesis. It’s two inches high when ready to travel and can disappear into a number of slots and corners of your gear bin or packed truck bed. Best of all, the Slim Twin’s aluminum legs lock tightly at multiple points to remain in place. The Tupike from Primus would have tied the Kovea’s entry if not for its angular lid. The rotating handle-lock might be testers’ favorite component of all products tested, and its legs fold firmly flat against the bottom. The long fuel line, convenient in use, is problematic when packed. 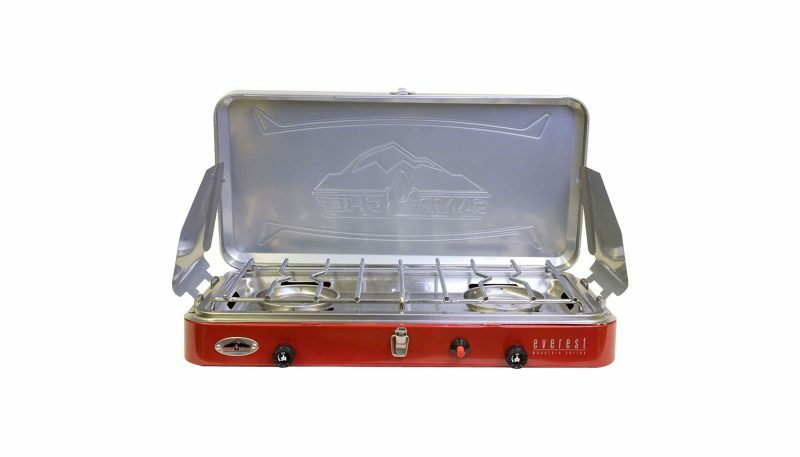 The Camp Chef Everest is the heaviest and largest stove in the bunch at 12 pounds, almost doubling the Genesis. 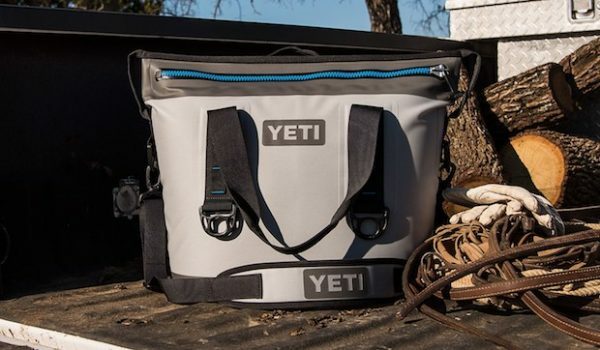 A handle is cut out from the front underbelly of the Everest and the lid locks tightly with a spring-loaded, front-mounted latch. 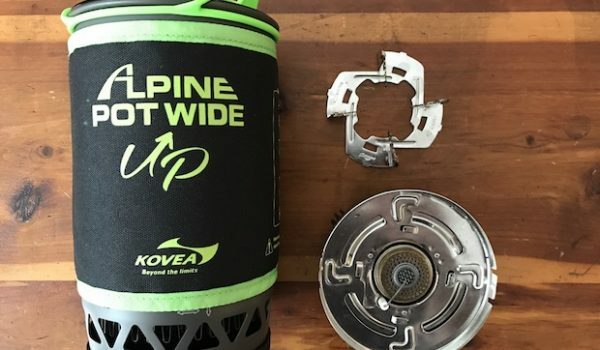 The Kovea Slim Twin’s fuel flexibility, packability, and broad windscreens edged out the Jetboil’s unique design and Jetlink connectivity to top this test criteria. Dropping the Genesis down a point is the fact that leveraging the Jetlink tech requires added investment in an already very expensive stove. The Slim Twin’s high stance gives the user better reach, too. The Tupike can run on isobutane and propane like the Kovea, but doesn’t come with adaptors for aerosol bottles and requires a tool to swap parts; the Kovea doesn’t. Its flexible fuel line and included bottle stand are nice touches, as is the sturdy stance its legs provide. 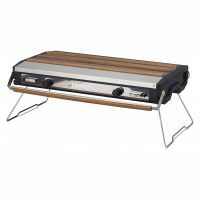 The included, one-burner griddle plate has some use, but doesn’t advance the stove enough to claim a higher position in the test. The windscreens are its Achilles’ heel. The Camp Chef’s top feature(s) are its fat, powerful burners and broad cooking space. The inwardly-cut carry handle under the front helps create clean lines, and it has the most ergonomic fuel control dials in the test. Still, its overall “less is more” approach, which has its place in the market, has a hard time keeping pace with the innovations of the tests’ other participants. The Primus, Kovea and Jetboil tied. The former two exercise the standard process of unfolding legs, opening a lid, connecting a fuel bottle, and pushing an igniter. The Kovea comes ready for isobutane canisters, requiring an extra 30 seconds to apply an adaptor to an aerosol can of butane or propane bottle when needed. The Tupike received was set for propane bottles, and requires use of an included multi-tool to insert an adaptor for isobutane. Both respective processes are easy, but in terms of time of setup, none of them were quite as efficient as the Camp Chef—the easiest to use and maintain in the group. The fat control valves are sturdy in hand, whereas the Genesis’ ground-level valves can be tough to manipulate for anyone with large or gloved hands. The same applies to connecting the regulator. 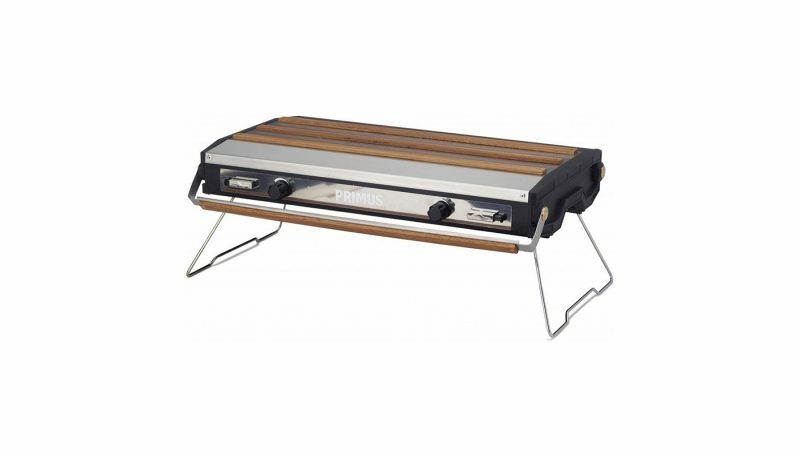 The Camp Chef sits flat and sturdy on any surface and uses common valve standards to attached fuel. Unlike in the Features rating, this is when the Everest’s straightforward design earns the win. Testing two burner propane stoves is easier than products purposely created for backcountry use. Theoretically, a standard week-night’s dinner can offer good insight into a camp stove’s overall quality and performance. Still, poor conditions are needed to fully emulate a camping scenario, and that was accomplished through winter treks and tailgates, windy summer afternoons, and cold, damp mornings. Portability is key, but small doesn’t always mean better. How does a stove’s design interact with the gear that accompanies it? Is it designed to be stacked or bagged? Throughout testing, stoves were pushed into corners and placed under coolers, lawn chairs, and wrapped bundles of wood. Durability could be tested in unison, in addition to how each held up during setup and takedown. Features are what will help the marketing team reach customers, and there’s no shortage of new stuff in this era of camp stoves. Testing needed to determine a balance between need and excess, and actual value versus window dressing. What worked and why? Does a given feature make a customer a better outdoor cook in some way? 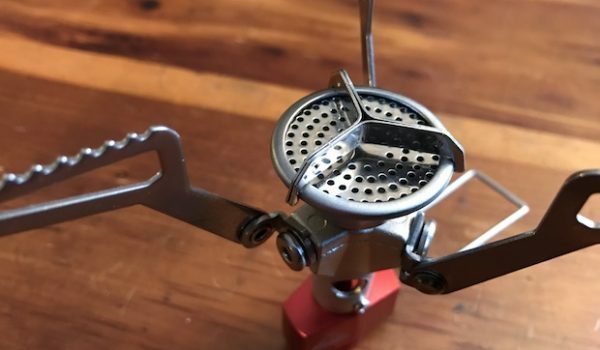 A two-burner camp stove shouldn’t really require directions to use. Testing started with that question: could products tested go from box to cooking without directions? From there, testing examined what features added a degree of efficiency, and what accommodated easy cleaning and storage. 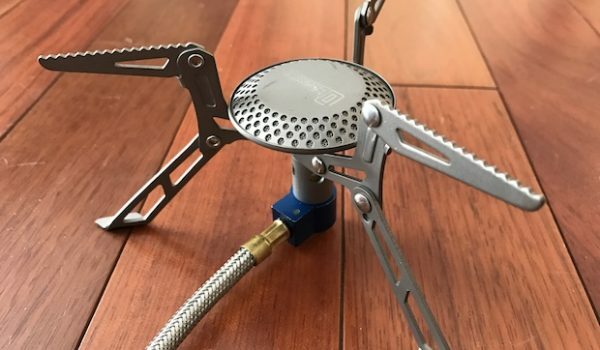 In short, we wanted to find out what scenario would make a camp stove a hassle to own, and used that question to drive results of this category. Camping stoves are larger and therefore less portable than backpacking stoves, meant for tables and tailgates. The market is dominated by stoves with two burners that run on propane, but alternative fuel capability has entered the market. The most common form factor is characterized by a rear-hinged lid that closes over the cooking surface for storage and carriage. Some camp stoves rely on deployable supports, but the market is most familiar with those which rest flat on cook tables or truck beds. There hasn’t been any dramatic change to the general cooking functionality of these products, but manufacturers have become more creative of late, adding aesthetic appeal and unique design choices that depart from historical market offerings. However, not everything new is good, and engineers are thus creating more stoves with an array of options and looks. Expect to find a car camping stove at a front-country campground, weekend cookout, or in a seasonal hunting cabin or ski hut. They’re also common in tow-behind trailers and converted vans. They’re good for more advanced meals and group cooking, as the general efficiency and cold-weather performance of propane enables a large array of meal volume and options.